For over 100 years, Keil’s Antiques has been a trusted name for exceptional quality, value and service in the antiques market. Our shop on Royal Street in the heart of the historic French Quarter has three floors filled with 18th and 19th-centry English, French and Continental items. 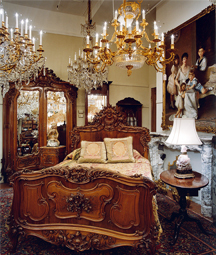 Founder Hermina Keil opened the doors of Keil’s Antiques in 1899. Keil’s remains a family business and today, granddaughter Andree Keil Moss and her son, Peter Moss, continue Keil’s tradition of attentive, knowledgeable service to valued customers. The sterling reputation of Keil’s Antiques serves as the foundation of our business, and we are proud to be a beloved keystone of the French Quarter today.